New York, NY—July 21, 2008—ECommerce Partners, one of the leading digital interactive agencies widely recognized for building successful businesses online, has been awarded Ad Tech’s 2008 Limelight Award for Best Business-to-Consumer Transaction website. 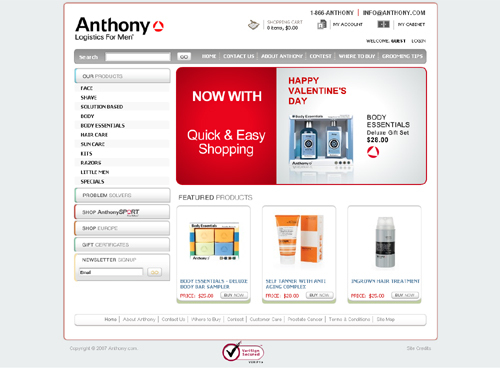 ECommerce Partners received top honors for its e-commerce site Anthony Logistics for Men, a men’s skincare brand. The 2008 Ad Tech awards, an industry event created to recognize talented designers and companies who demonstrate excellence in interactive marketing, hosted some of the leading U.S. interactive and technology agencies and web design teams. ECommerce Partners’ winning website was chosen by an executive panel of industry experts and judged on four key criteria: creativity, ease of navigation, results based on objectives and overall experience. Since 1998, New York based ECommerce Partners has been developing innovative sales, design and marketing technologies and solutions for many of the internet’s top and emerging businesses. Through innovative methods, ECommerce Partners enables its clients to tap new revenue opportunities while streamlining operational systems. Highly sought after by many of the top Fortune 500 companies, ECommerce Partners is widely recognized for building successful business online, from design to technology. For more information, please visit www.ecommercepartners.net. Press Release re-post. Originally published July 21, 2008. We're among 5 finalists in the Ad:Tech Awards!